Wear this pair of cat socks as the day is winding down. These cat slipper socks are 75% cotton, 15% nylon and 10% spandex. 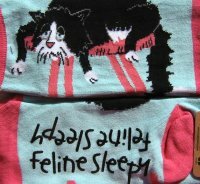 The soles of the socks have the words "Feline Sleepy" written in a non-slip material. Women's one size fits all.